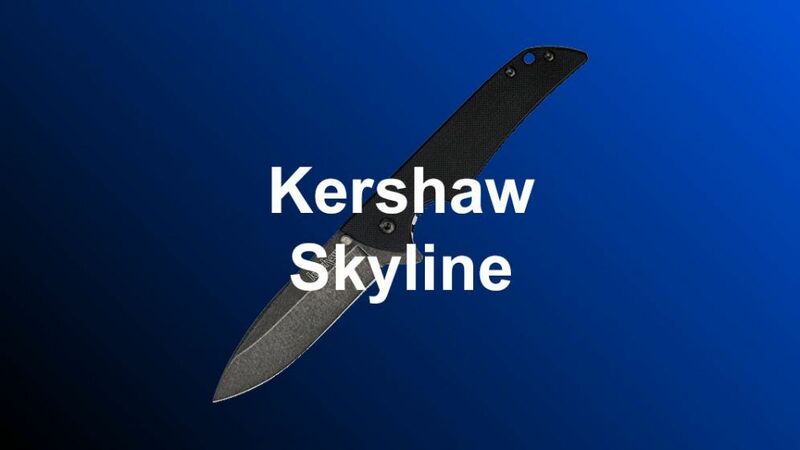 In this Kershaw Skyline review, we are going to take a look at one very popular EDC knife. 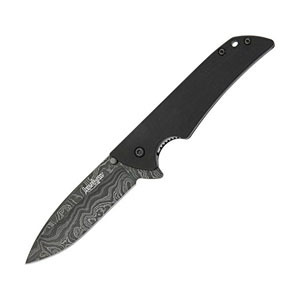 The Skyline is a high quality, economical manual folding knife. 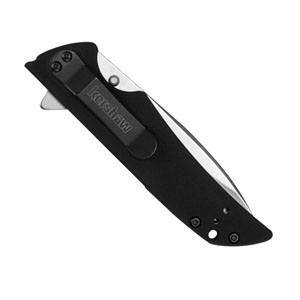 It is assembled in the United States and is made by Kershaw, which is a quality brand. The knife has a drop-point blade with a linear G-10 handle that is designed with heavy use in mind. As an Every Day Carry (EDC), its light frame, quality material, and attractive price tag make it an accessible choice for any enthusiast searching for their next knife. Disclosure: Some of the links in this article are affiliate links, where I make a small commission at no extra cost to you. 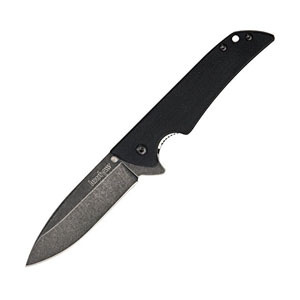 This all-purpose knife by Kershaw combines heavy-duty material and safety into one low profile body. The 14C28N steel provides the blade with an unusually valuable compromise between hardness and flexibility that makes it more resistant to both dulling and breaking than similar folders on the market. A molded synthetic pommel compliments the features and look of the blade, as well as provides comfort and grip when using the knife. The mechanism is both solid and minimal in design. Reliable deployment and locking is always guaranteed. So whether you are on the market for a new EDC or the next addition to your blade collection, the Skyline 1760 is the knife for you. The Skyline’s blade is composed of high quality Sandvik 14C28N stainless steel. This blend was specially designed for Kershaw’s folding and fixed blades to withstand varied daily use. This Swedish alloy is based on earlier recipes for razor blades. The material holds a sharp edge for an extended amount of time. Additionally, touching it up is extremely easy with just a few passes over a fine-grain stone and strop. This brings it back to factory sharpness. It has an above average resilience to rolling or micro chipping and boasts of a Rockwell rating of 55-62. This rating indicates that there is a slight flexibility that perfectly complements the hardness required to hold a perfect edge. The blade is as aesthetically pleasing as it is technically sound. It comes in a stonewashed finish that makes smudges and small scratches less visible. The drop point tip leads into a plain cutting edge that ends in a small choil right before the flipper. The flipper itself is large and protrudes far enough from the handle to easily engage the blade with an index finger. Once you deploy the blade, it doubles as a finger guard for added safety and stability. The blade measures 3.1 inches making this knife small enough to be nearly invisible in a pocket yet large enough to remain useful for most applications. The handle is designed with a G-10 resin. It is made by saturating fiberglass cuttings with epoxy resin, then molding it into the desired shape by adding pressure and heat to the plastic until it takes form. This can be accomplished either through direct manipulation or forcing it into a mold. It appears that a texturized mold was used by Kershaw due to the precise ergonomic design of the handle. It is lightweight and impervious to heat, moisture, or softening over time. You can be sure it is one of the best materials on the market for this application. If desired, the material is also able to be shaped differently. You have this option as an owner. If you choose to do so, be careful not to grind into the spacer or liner. The G-10 resin was probably the most well rounded material for use in the Skyline. Kershaw made a good call using it instead of other synthetics for this application. Two scales flank the locking mechanism to form the handle. Three screws connect these while a backspacer made of the same G-10 material separates them. During molding, the epoxy of the Skyline was texturized with a very fine waffle-like pattern for an improved grip in wet or slippery conditions. Overall, it measures 4.25 inches long and fits nicely into the hand. To maximize control, the contoured handle has a deep finger well and guard. The large, stonewashed pocket clip is removable and adjustable to sit either tip up or down in a right-hand pocket. A lanyard hole is added at the end for convenience. The Skyline, as mentioned earlier, is a manual knife. A flipper is exposed when the knife is closed. This area has been enlarged so the thumb can easily find it. This is a refreshing improvement over similar knives whose flippers tend to be too small for large hands to operate easily. The mechanism is very smooth out of the box. An occasional oiling keeps this knife working nicely. Since no spring is used on this knife, minimal maintenance keeps the rotator free of excess dust and oil. With proper care, a simple thumb flick will always suffice to open the blade. The single liner within the handle acts as the linear lock once the blade has been deployed. It is encased within the G-10 scales and connected to the left one via a couple of star head screws. It is not stonewashed like the blade making a nice texture contrast in the overall scheme of the knife. The fact that there is only one liner means that the overall weight of the knife is kept to a minimum, perfect for easy concealment and portability. Molded into the blade are a pair of blade stops. They are located where most users are accustomed to thumb studs and look like smaller versions of them. In fact, they are meant to keep the blade from continuing to move past the 180° point when being opened. They are especially useful in the Skyline as the momentum exerted on the blade by the flipper during deployment would otherwise loosen the lock over time. As soon as the stoppers reach the divets that they rest in, the liner engages and keeps the blade locked in place. As a result of these features, there is virtually no blade play. The lock does not give during use, regardless of the knife’s age. The Skyline is a fantastic knife that can withstand daily use while remaining handy and sharp. The blade is made of high quality steel. The blade stops act as integrated extensions of the locking mechanism. This feature adds another dimension of safety and reliability to the knife. Some will want the fancier Kershaw Skyline Damascus over the regular version. It's definitely an attention getter with it's unique style and looks. The Skyline pommel is both sturdy and comfortable in the hand thanks to its G-10 composition. This materials stays reliable regardless of environmental conditions. A liner lock, flipper-based opening system, and the aforementioned stops all contribute to a durable yet light mechanism. 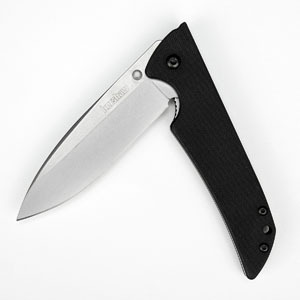 With these attributes, it’s no wonder this Kershaw is one of the company’s most popular products. If you want a similar sized knife with a tanto point, check out the Brawler.​ You should also check out one of the most popular knives, the Leek.